Today I’m going to tell you about Tuvalu! Tuvalu is an island country located right between Australia and Hawaii. Sounds like a nice place to be, huh? Polynesians have lived in Tuvalu for thousands of years, and many of them continue to practice their traditional ways. Tuvaluan music is beautiful. Music is considered a sacred act. It is a way of telling stories, settling disputes and recording history. There are about 11,000 people that live on the nine islands of Tuvalu. Most live largely by fishing and growing their own food. Many islands in the South Pacific are volcanic, and because volcanic soil is extremely fertile that means that plants grow easily in it. The islands of Tuvalu, however, are not very hospitable to gardens. They are mostly made up of coral — pretty dry, brittle stuff. The vegetables that grow best are pulaka, bananas, breadfruit and coconut. (Click here to read my post all about breadfruit!) Pulaka is similar to taro, a starchy root vegetable — kind of like a turnip or potato. It tastes great if you mix it with coconut milk! It works like this: greenhouse gases from cars and factories make the air warmer, which melts icebergs, which makes sea levels constantly rise by tiny amounts. 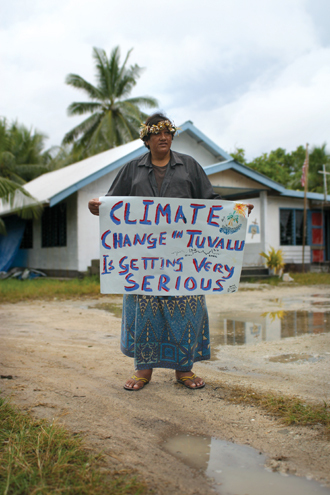 While that isn’t a big deal in places like New York and Tokyo, in Tuvalu it spells disaster! The islands are not what you’d call mountainous, standing at 13 feet above sea level at the highest. Losing a few inches to the ocean means lots of Tuvaluans are out of a home! Some people have described Tuvalu as “sinking into the ocean.” Oh no! To see more photos of Tuvalu and learn how to help, visit The Sinking of Tuvalu.